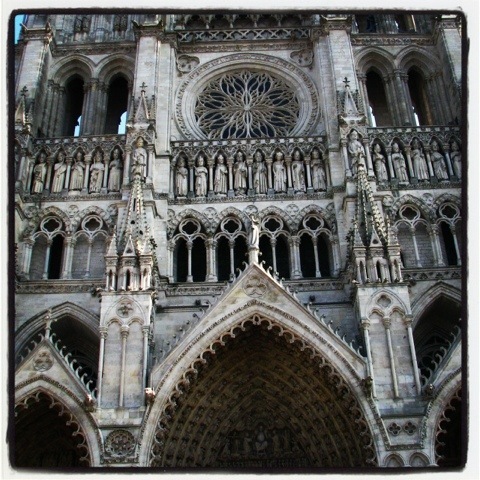 While we were in Amiens, France for a short stay a couple of weeks ago (at our two star hotel) we saw many things. After the giant cathedral in the center of town, by far the most amazing thing we saw was a giant, blow-up colon in the middle of the street. We first saw it in the early evening walking to dinner. It was giant and bright pink and it snaked down the center of the street like a gargantuan pink slug. For a moment it felt like the set of a 1960s horror film, only this thing wasn’t fighting Godzilla. It actually took us a few minutes standing there staring at it to figure out what it was. The point is that ‘a giant colon’ is not the first thing that jumps into your mind when you’re trying to identify an enormous object in the middle of the street in a small French city. It appeared that the colon was part of a health fair and although it was possible to walk through it, it was closed for the night. During dinner, the kids could not stop talking about the giant colon and how they really wanted to go in it the next day. Not exactly the best dinner conversation – especially when you’re eating squid. Eew. On our way back through town we had to pass the giant colon again and at this point we saw a dude strumming a guitar move aside the barrier and walk slowly through the giant colon while strumming some Bob Dylan. He continued to strum in the colon until he was chased out by a security guard. I did have to wonder aloud about the job satisfaction level of a security detail in which you were tasked with protecting a giant colon from Bob Dylan strumming hippies throughout the night. As expected, priority #1 for the boys the next day was to go for a stroll in the colon. When we neared the entrance to the giant colon, we were given a short quiz about general colon health with questions we were supposed to find the answers to on our way through it. 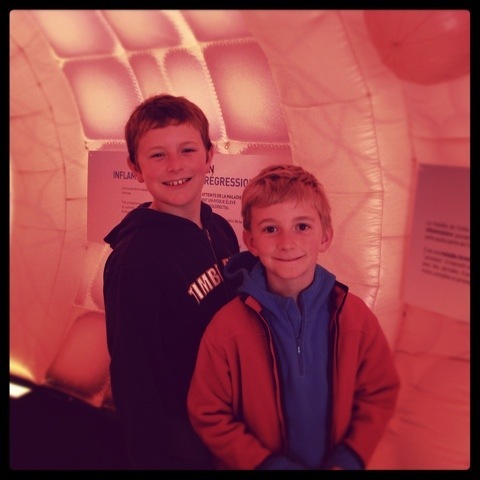 We grabbed the questionnaires and headed into the giant pink slug to learn more facts about colon health. The only problem was that we were in sort of a rush, since we needed to check out of our hotel, so rather than working slowly through the questions and answers, I gave the kids the short version of the message. Get a colonoscopy. You may not want to do it, but you must. Yes, it is a tiny camera in your bum. Yes, it probably kind of hurts a bit, but you must do it. End of story. We were considered colon deadbeats by the time we got to the end of the exhibit because we hadn’t filled out any of the questionnaire. A man approached us when he heard us speaking English and asked where we were from. 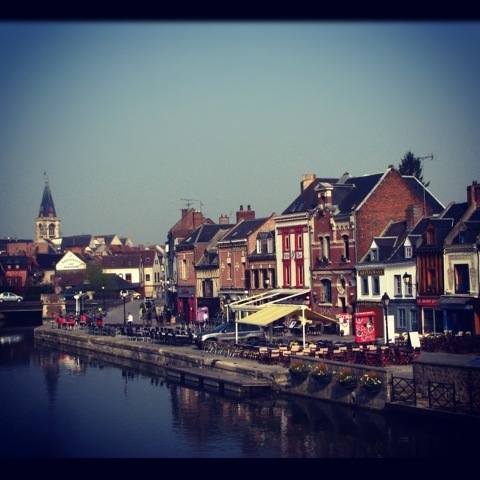 We explained that we were from the US, but were living in France and we apologized for not completing the exercise due to our short timeline. That’s when I said, “Sorry we’re just rushing through, but we really HAD to come to see your giant colon. It’s amazing!” After that statement, we had a slightly awkward moment of silence. I guess that’s the kind of thing that can happen often when you’re hanging around in a giant colon all day. Owen: Hey Ma! I’m getting really big muscles in my arms by squeezing my colon. Eamon: Dad, stop slamming on the brakes! My colon just fell under the seat. Owen: I can’t find my colon! Have you seen it? Eamon: I love my colon! It’s so cute! I know that colon health is no laughing matter, but hey, you might as well have fun with the thought of a tiny camera up your bum as long as you can.